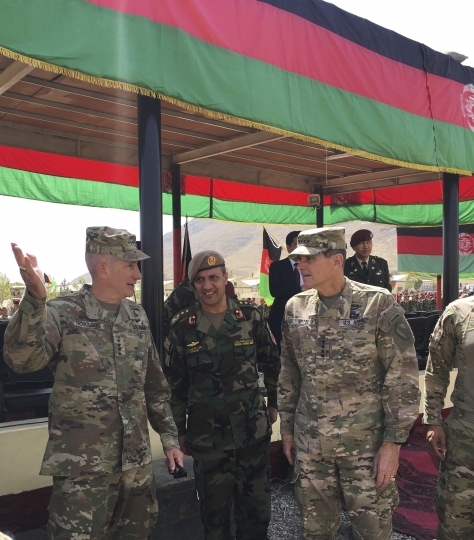 CAMP MOREHEAD, Afghanistan — Signaling that the U.S. military expects its mission to continue, the top U.S. commander in Afghanistan on Sunday hailed the launch of the Afghan Army's new special operations corps, declaring that "we are with you and we will stay with you." Gen. John Nicholson's exhortation of continued support for the Afghans suggested the Pentagon may have won its argument that America's military must stay engaged in the conflict in order to insure terrorists don't once again threaten the U.S. from safe havens in Afghanistan. The White House announced that President Donald Trump would address the nation's troops and the American people Monday night to update the path forward in Afghanistan and South Asia. 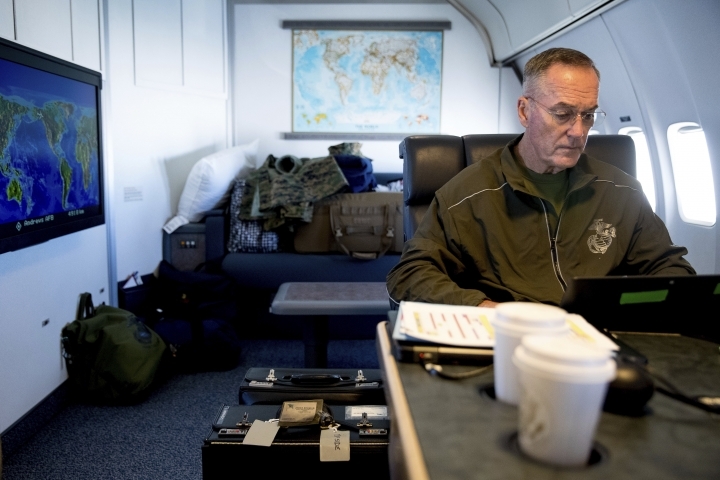 Nicholson, speaking prior to the White House announcement, said the commandos and a plan to double the size of the Afghan's special operations forces are critical to winning the war. "I assure you we are with you in this fight. We are with you and we will stay with you," he said during a ceremony at Camp Morehead, a training base for Afghan commandos southeast of Kabul. Trump wrote on Twitter on Saturday that he had made decisions at Camp David, "including on Afghanistan," but he did not say more about it. The expectation had been that he would agree to a modest boost in the U.S. war effort, while also addressing broader political, economic and regional issues. 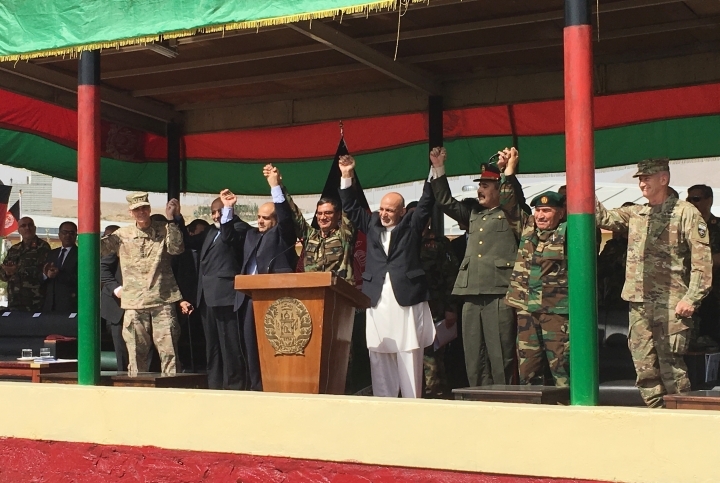 At Camp Morehead, lines of Afghan commandos stood at attention as Afghanistan President Ashraf Ghani and a host of proud dignitaries sat under flag-draped canopies and welcomed the advancement in their nation's long-struggling military. In short remarks to the force, Nicholson said a defeat in Afghanistan would erode safety in the U.S. and "embolden jihadists around the world." That's why, he said, the U.S. is helping to double the size of the Afghan commando force, adding that the ceremony "marks the beginning of the end of the Taliban." He said he'd be able expand training locations and insure they have advisers at all the right levels, including on the new Afghan special operations corps staff. 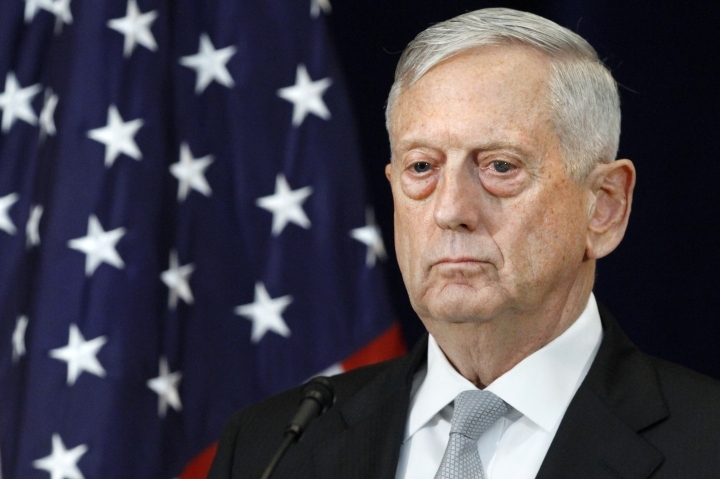 According to a senior U.S. military officer in Kabul, increasing the number of American troops would allow the military to quickly send additional advisers or airstrike support to two simultaneous operations. Right now, the official said, they can only do so for one. The officer said it would allow the U.S. to send fighter aircraft, refueling aircraft and surveillance aircraft to multiple locations for missions. The officer was not authorized to discuss the details publicly so spoke on condition of anonymity. Burns reported from Amman, Jordan.